If you want a totalitarian regime, you have to take extra steps to control the populace. And that’s just what Venezuela has done with the advent of a biometric ID called Carnet, loosely translated as The Fatherland Card. Carnet is closely related to the dystopian Chinese social credit program and in fact, uses much of the same technology to track and spy on citizens. And it’s been in the works for a long time. In April 2008, former Venezuelan President Hugo Chavez dispatched Justice Ministry officials to visit counterparts in the Chinese technology hub of Shenzhen. …Once in Shenzhen, though, the Venezuelans realized a card could do far more than just identify the recipient. …And ZTE, whose role in the fatherland project is detailed here for the first time, is at the heart of the program. 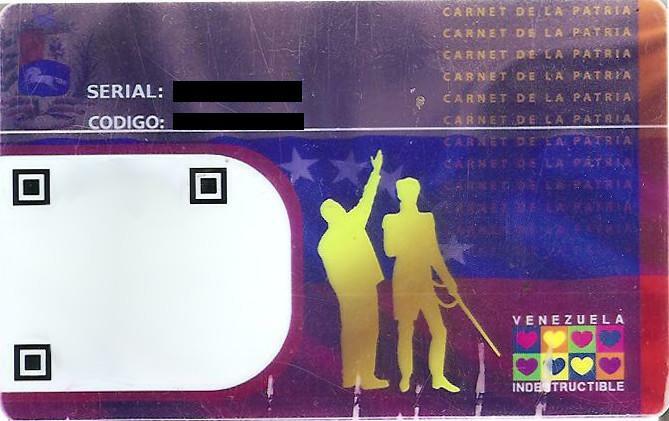 Without this card, just to name a few things, Venezuelans cannot access services like healthcare, they can’t purchase food, and they are unable to vote in elections. What exactly is the Carnet? Although the media has only been talking about it being launched in 2017, there have been predecessors to the current ID, which you’ll hear about in a moment. Although it existed before, it was rolled out with fanfare in 2017. So, long story short, to get any desperately needed government aid, you had to get this card. One of its most powerful tools is the Carnet de la Patria (Homeland Card). This is an identity card ostensibly meant to improve the efficiency of government social programmes by linking everyone who requests and receives services and handouts to their government records. But, in reality, the card’s main function is to keep a tight grip on the state’s 2.8memployees and also the millions of people seeking government assistance, many of whose livelihoods depend on it. To get a “Carnet” you have to provide biometric data – your fingerprint. To ensure you are who you say you are, you may have to scan your fingerprint in order to purchase food, vote, access healthcare, etc. So what is the reality of living with the Carnet system? I talked to Jose about it. Here’s how Carnet was instituted. As a former oil worker, we were forced by the corporation to go to a temporary office so they could take a digital picture (I believe I remember my right thumb and index were digitally scanned just like at election time) and print it on a carnet. Oddly, the code of this card had just one or two digits more than my national ID card. We were notified by our supervisors that everyone up to the last member of the personnel was under the obligation to get the Carnet. Those who refused to get it were going to be severely punished. I know this perhaps sounds exaggerated, but it is the truth. Some people were even fired. Without any serious institution to go to, those who were fired had nothing to do to reclaim their rights. This kind of stuff had happened before, indeed. Former candidates used to buy votes from the poor people by providing them with cement blocks, rebar, roofing materials, and some other similar stuff to improve their hutches in the barrios. And this under “democratic” governments, go figure. So people were somewhat used to blackmail. Of course, it didn’t stop with employees of big corporations. Soon, people who refused to get the Carnet were denied basic needs. It spread to public employees next. The approach of these twisted people that were given authority through democratic ways to make decisions in the economy harmed severely the already stressed productive means of Venezuela. Our population is (was) mostly young, and with a vibrant, growing fertility rate. Therefore, the need for food was increased at a much faster rate than the accompanying growth of the food and services industry. The tyrants then decided to seize the production media (once they started to lose popularity) and ration whatever production they could put their paws on. The result was the mess that we are seeing now. One of the social control means was the FORCING of this card into every public employee. The refusing of getting into that system allowed them to clean whatever reluctant opposition they could have in the public management system. Now, this very same sector is screaming for food in the own Maduro’s doors. The carnet would supposedly provide access to medicines, food, and housing programs. I know that the military personnel even would get cars, in a country where the new car production was seized for the socialist party elite…just like Russia, Cuba, North Korea and such. No one can get a new car there and it has been like this for years. Prices in dollars are twice what they are in other countries. Oh and I forgot to mention that subsidized gasoline is available for those holding the carnet. Mostly they would fill their tanks in the border cities like San Cristobal, get that gasoline in some jerry cans, and would sell it or trade it for food in Colombia. Without cars passing through the bridge now, chances are that this gasoline is going through the bushes. Without any means to get food, medicines at affordable prices (we are talking about prices here, people holding the carnet could barely make a living some time ago), or even gasoline, people without the carnet were better off leaving the country. Those most affected are the elders. Payment of pensions was to be made through this system, forcing poor older people to make rows for 8 or 10 hours to receive a pack of money barely enough to buy a dozen eggs. But without the carnet, even this handout was impossible to get for them. Of course, those elder people who have refused to get the carnet in these last 3 years have died like flies. By the thousands. I do know that Nico sold this as the big socialist achievement in history. He even issued bonuses for proven single, pregnant women with more than 2 children, encouraging them to have more children because they would receive an allowance for every one of the babies. Of course, they would receive money throughout the carnet de la patria. It’s even embarrassing mentioning this! A lot has been written on this website about the advent of personal microchips and how they might be forced upon people at some point in the not so distant future. Of course, it will be done with our “convenience” in mind and then at some point, it will be nearly impossible to function in society without being chipped. Basically everyone, according to some experts, will get chipped. And so it is in Venezuela too, that functioning without the Carnet is nearly impossible. And functioning with the Carnet is nearly impossible too unless you toe the Maduro party line. Of course, this restriction of resources is entirely against our Constitution. Ironically, the Constitution that Hugo left behind him. After the election process, the people holding the carnet was instructed to immediately go to some data collection points called “red points” where they had to register themselves and were asked an entire series of questions about what programs they received, like housing, pensions, medication or feeding. If they voted against Maduro, they would be rejected from those programs. I know this first hand because I was there. However, things have changed. They will try (perhaps that will change soon once Maduro is no longer in place) only payment means can be done with this carnet. I don’t know because never used it to receive any money, or make some payments, nor even to get some gasoline. I left before this implementation was fully achieved. I do have my carnet, though…as a memory of the infamy of these years. At the present, the menaces have made more effect that the carnet itself, which has only been used to receive bonuses and pensions, and the access to some different programs that have not still gone dry because lack of funding…something that will run entirely dry because it is Pres. Guaido now who holds the checkbook. But used as a psychological tool, its impact has been huge. Of course, China has much more advances in this area. They use it effectively to control political activity and to forbid access to public transportation and even to schools. To provide a little of our Venezuelan style, and that we have some good hackers around there, when they used the carnet in the first voting to choose the fraudulent constituent assembly, Nico was the first to vote…just to receive a screen message that said his carnet had been revoked or did not exist….on national TV, embarrassing him in front of tens of thousands of followers. Quite funny. One of my best memories regarding that stuff indeed. And this has worked against them, too, because it is totally against our Constitution. It has been used as a means of EXCLUSION AND BLACKMAIL of the most vulnerable population. This is a crime. This is a case study in control. Years ago, back in 2014, I wrote about this card although, at the time, I didn’t know the name of it. I wrote about the fingerprint registry that was required to buy food so that the Venezuelan government could prevent the “crime” of food “hoarding.” This is when people were really beginning to see that things were going downhill fast in the country. The AP reports that in an effort to crack down on “hoarding” that ID cards will be issued to families. These will have to be presented before foodstuffs can be purchased. Is it just me or do you see the future unless something changes dramatically?